Rudolf's Kunstkammer was like a private museum, reputed to include strange and wondrous items. The present page discusses an inventory of this museum, that was lost, but was rediscovered after the second world war by Gustav Wilhelm, the former director of the art collections of the Fürst of Liechtenstein (1). It was listed in the manuscript catalogue as "inventory of an unknown collection". 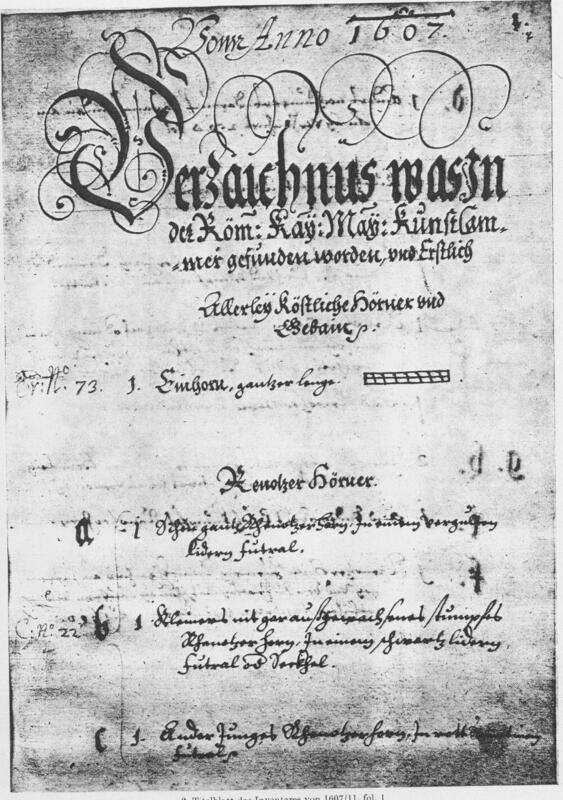 The title of the MS is: Von Anno 1607. Verzaichnus, was in der Röm:Kay:May:Kunstkammer gefunden worden [...]. 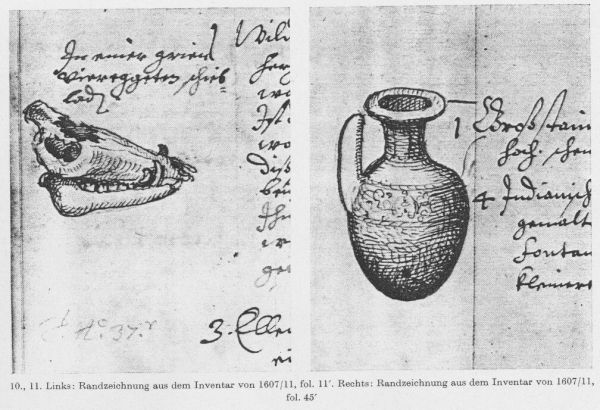 (From 1607, inventory of what has been found in his majesty the Roman Emperor's Kunstkammer, etc.). 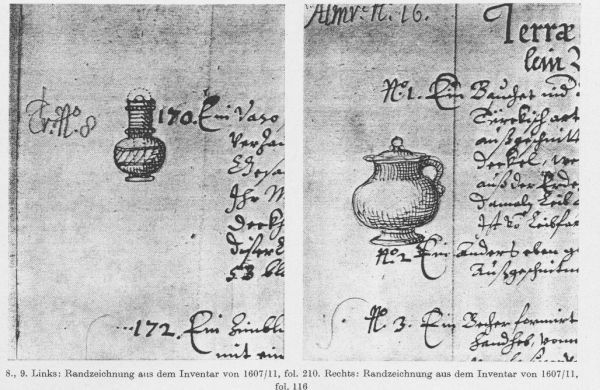 This 1607 inventory is much more detailed than the previously known inventories that were produced several years after the death of Rudolf, one in 1619 and described by J. Morávek (2) and one in 1621 described by H. Zimmermann (3). 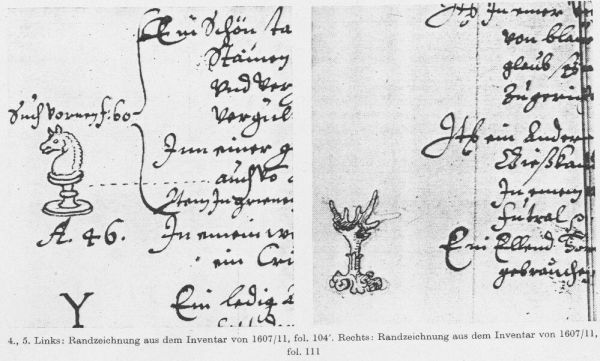 Another inventory was made on order of Mathias, immediately after Rudolf's death, in order to arrange the inheritance with his two brothers Maximilian III and Albrecht VII. This so-called Nachlaßinventar has not yet been found. Our main interest will be the list of books owned by Rudolf. Let us first look at the smaller inventories. Viel, in zwo almarn, jede mit vier tachen, ungezehlten und angeseczten püchern, in lateineischer, teutscher, wallischer und andern, wie auch in türgkischer sprach, ungeschäczt. In einer andern almar mit zwei fachen, darinnen schöne kunstpücher von malerei. Effectively, no attempt is made to estimate the value of the books, or even to count them. They are contained in three almar, the meaning of which is not entirely clear to me, but two of them have four compartments or shelves, while the third has two. In the publication of this inventory (see note 3), items have been numbered (presumably by the author) from 1 to 1428. Descriptions are a bit more detailed than in the inventory of 1619. In addition, there are several additional documents with lists of items that have been added and/or removed up to the year 1648. The author of the publication also adds many useful comments, some deriving from comparison with a later inventory of 1635.We find some books among the other items. Following is my transcription of books and similar items, without being certain that this is complete. 402. Zwei büchl in silbern kästeln. 607. Darinnen allerlei bücher, darauf 5 große erdene gemahlte krüeg. 609. Darinnen allerlei bücher und oben darauf ein großer schweins(kopf), vom holz geschnitten. 620. Darinnen allerlei bücher und oben darauf ein indianisch schiff vom leder. 690. Darinnen allerlei gemalte und geschrieben bücher, darauf ein gestem vom elent. 724. Zwei büchel vom türkischen papir. Instead of three, we find four almar with books. 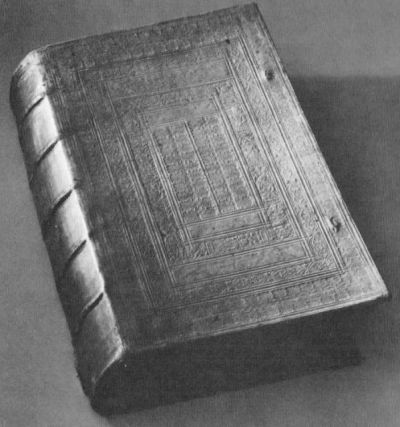 The very large book with the number 661 is presumed to be the Codex Gigas. Coming back to the catalogue MS of 1607, its discoverer Gustav Wilhelm prepared a transcription in 1947, and gave it to Erwin Neumann in 1956 for publication. The latter managed to identify a large number of objects, but died before the work could be completed. It was finally published in 1976 (4). The manuscript measures 19,5 x 34 cm and has 415 paper pages. The binding is parchment over cardboard. On the inside cover is written: Ex libris Liechtensteinianis The title of the MS is: Von Anno 1607. Verzaichnus, was in der Röm:Kay:May:Kunstkammer gefunden worden. (From 1607, inventory of what has been found in his majesty the Roman Emperor's Kunstkammer). See the illustration of this title page at the top of this web page. It contains entries up to the year 1611. Items are numbered. The author has been identified as the painter Daniel Fröschl, who, as from 1 May 1607, was the successor of Octavio Strada as imperial antiquarian (5). The MS is still preserved in the library of the Fürst of Liechtenstein, in Vaduz. The inventory has completely changed the understanding of Rudolf II as a collector. Originally, he was primarily perceived as a collector of Mirabilia, Rara and Curiosa (strange and wondrous items, of which he indeed have a large number), with an additional interest in paintings, but now his image as universalist and aestetic came into the foreground. In 1908 his collection was still described as a varied mix without any organisation (6). It was only known from the shorter catalogues that were mentioned above. The present inventory clearly exhibits the encyclopedic character of the museum. It contains specimens from the most varied areas of nature (Naturalia), art (Artefacta) and science (Scientifica) and is largely organised along these lines. The inventory only covers the Kunstkammer in its most narrow sense. There is no listing of Rudolf's paintings, his armoury, his regalia and treasures, gems and antiques, tapistries or the decorations of the rooms. These have been described to some extent in the smaller catalogues. Following are some images of the inventory manuscript. The marginal drawing of a long-haired lady on fol. 35 is perhaps to be identified with one of Rudolf's mandrakes shown in the following image. 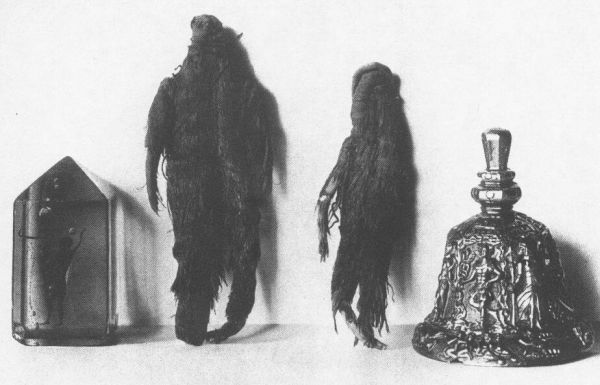 These two are now kept in the Vienna museum and supposedly belonged to Rudolf (7). With respect to the Voynich MS, Rudolf's collection of books deserves special interest. The inventory includes a number of books in the part referring to Scientifica, but it clearly does not represent his complete library. This question is addressed further below. The inventory has a section describing books on fols. 376-388, which is covered by Bauer and Haupt on pages 130-140. The books listed in the inventory are contained in five chests (Truhen) numbered 37, 58 and 96-98, and it has been suggested that this indicates that they were prepared to be moved (8). Of the approximately 250 books that are listed, only (about) 5 had been identified in Bauer and Haupt (1976). Only a summary can be given here. Worth noting is that the index to the inventory on fol.III specifically mentions the herbal books of Dr. Rauwolff. Among the 'turkish items' are in total 12 books in arabic and turkish, nrs. 821-828. A Schreibtisch (desk), nr.101, including one book in quarto. Truhe Nr. 58, with various printed and handwritten books. Items 2576-2584. Continued: items 2585 - ... Includes Octavio Strada's books. The inventory does not mention any book in unknown writing or language, or in code. Furthermore, the large collection of alchemical books known to have been owned by Rudolf is not found in this inventory. Some of these were taken to Sweden as war booty, and later given to Isaac Vossius, who brought them to Leiden, where they are still preserved. 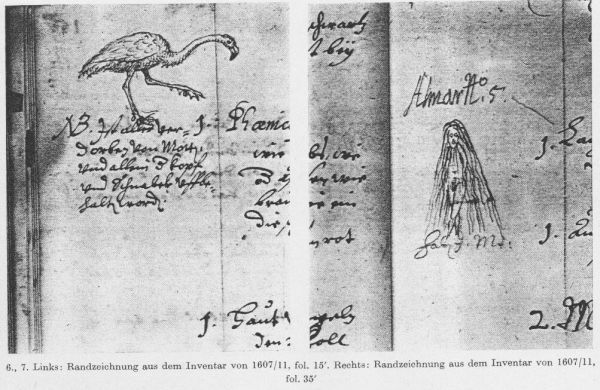 has in the past reminded me of the Voynich MS, though this was clearly speculative. This speculation has also been published in Zandbergen and Prinke (2016) (9), but in the mean time, it can be said with near certainty that this concerns two copies of Hrabanus Maurus' Liber de laudibus Sanctae Crucis. The interesting story about these books can be read here. The various collections of books of Rudolf II are addressed in some detail in Richeterová (2016) (10). She concentrates on Rudolf's alchemical book collection. See points out that the inventory includes only very few items called 'philosophical', and also that the composition of Rudolf's library (or in fact its locaton) is not very well documented. Beside the Kunstkammer, there was also the Keyser's Hofbibliothek, which is distinct from the Viennese court library. Rudolf liked to peruse books from the Viennese library, which was managed by Hugo Blotius, and there are several handwritten records from Blotius related to magical or alchemical books that he had transferred to Prague. Richterová also refers to a now lost Prague library catalogue written in 1636, and from the collections that were taken to Sweden (Stockholm, Uppsala, Lund) and in part to Leiden, it is clear that Rudolf had a very large book collection of which we no longer have a good overview. The main sources for this subject are Bauer and Haupt (1976) and Prag um 1600 (1988). As Bauer and Haupt (1976). Fröschl was imprisoned after Rudolf's death and died in 1613. See Zandbergen and Prinke (2016).